The early Eurobike buzz is an electric, mini penny farthing. As cool as that sounds, it also causes some concern in the position of the cyclists and in “doing a header,” “endo,” or getting out of the way of a delivery truck. The modern bike we ride today is based on an innovation called the safety bike. It had wheels of the same size, double triangles, and so on. Now we don’t want to buzzkill any excitement about an electric bike that folds and all, but hope they’ve done some testing on potholes and bumps. To their credit, YikeBike’s FAQ address safety, handling, and maneuverability and they claim they started with a blank sheet of paper. 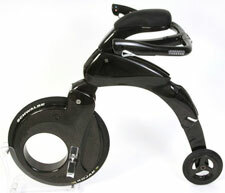 The bike has built-in lights and maybe it’s like a folder that rides on rollerblade wheels or the Strida. Cool for going a block to the subway and about human-powered urban mobility, as opposed to a Segway. We’re on the lookout for the YikeBike at Interbike and hope it rides as good as it looks. We do wonder why this industry constantly reinvents the old. Imagine if the computer industry was still on 8 bit Ataris, but dressed up in carbon cases. Notes: Penny Farthings (aka boneshakers) were called that because one of the wheels was smaller than the other and looked like a penny and a farthing. 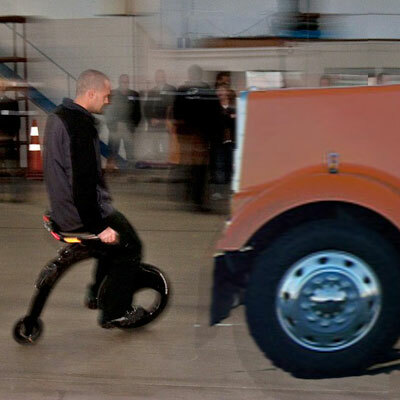 The YikeBike truck photo was photoshopped for this post.